But quite honestly, I’m really enjoying this change of pace. I’ve done quite a bit of upholstery over the years, but upholstering 10 chairs (two of which I built from scratch) in just a few weeks is a new challenge for me. A few people mention to me that they would never tackle such a project as building their own wingback chairs. That’s totally understandable. It is quite an involved project! 🙂 Although on the difficulty scale from easy to difficult, I’d rate it somewhere around “moderate.” If you have any building/tool experience, you should be able to tackle it with no problem. And then a few people asked if it really is cheaper to build my own rather than just buying some ready-made chairs. I had to stop and think about that, because while I’m always looking to save money by doing my own projects, building my own chairs (or doing any DIY, for that matter) isn’t always strictly about cost and getting things on the cheap. Cost is almost always my initial motivation for DIYing something, but there are other factors that are important to me as well. I don’t actually know how much my wingback chairs will cost me in the end. 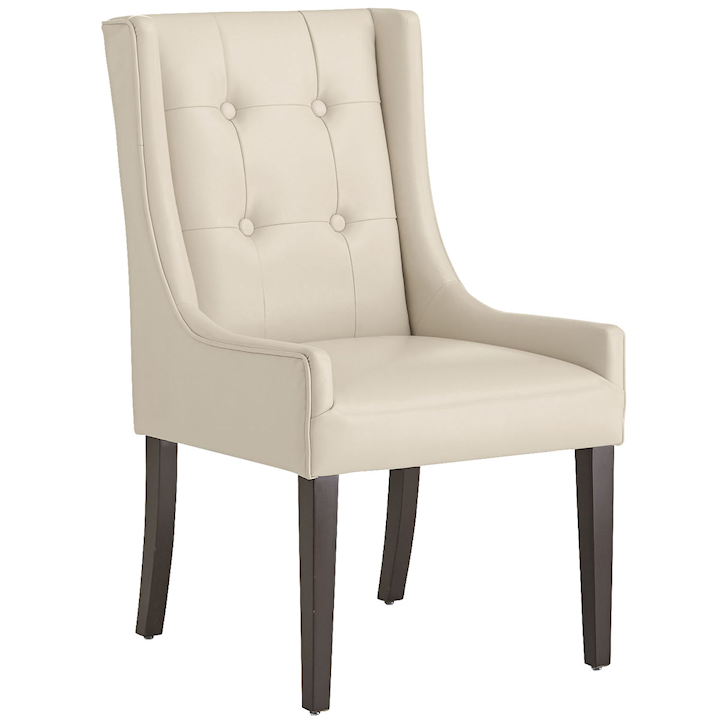 I’ll tally all of my costs and share those on my final wingback dining chair post. But for now, I’m going to guesstimate that they cost somewhere between $200 and $250 each. So I went in search of what I could purchase ready-made in that price range. This Mason dining chair from Pier 1 would cost me $270.57. That’s a perfectly nice chair. But if you know me at all, I think you can see right off why that chair wouldn’t work for me. They did have others with patterned/colorful fabrics, but none of them appealed to me at all. And $270 per chair is a lot to pay for something that isn’t my style at all and wouldn’t look right in my house. 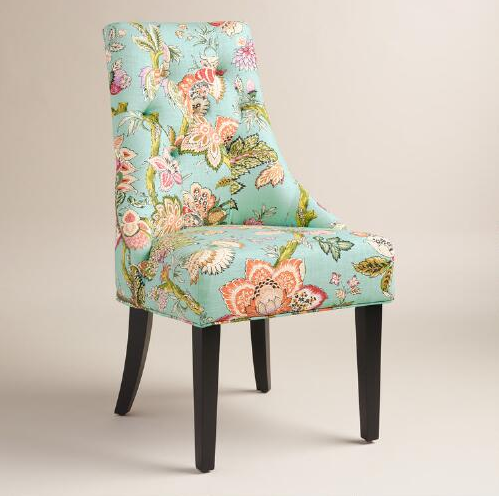 This chair from World Market is much more my style, with the colorful floral fabric on it, but that fabric would clash horribly with my kitchen. These would cost me $346.38 for a pair, which isn’t bad just from a cost perspective. But when it’s not the right style or fabric, and doesn’t fit my vision at all, it’s wasted money. Anyway, my point is that making my own chairs (or DIYing other projects around my house) isn’t necessarily about getting them as cheap as possible, although saving money is generally my original motivation, and it’s almost always the outcome. But the biggest satisfaction I get out of DIYing things like wingback dining chairs is that I get a completely custom look at a fraction of the cost that I would pay to have that custom item made/done for me. Custom is the key for me. I don’t want to go to all of this effort just to end up with a generic-looking house. Frankly, I take great pride in the fact that there’s virtually nothing in my house that a person can see, like, and then rush out and buy. You know how some bloggers have those “shop our house” pages where they fill a page with affiliate links to the items that they’ve used to decorate their homes? Yeah…I’d never be able to have a page like that on my blog, and quite honestly, I love that fact. My mural in the entryway is a good example of that. That whole idea came about because I fell in love with Schumacher’s Birds & Butterflies wallpaper and wanted to use that design somewhere in my house. But that wallpaper costs about $154 per single roll, and is sold in double rolls. In order to cover those panels, and have the patterns match perfectly (which is where you lose money and waste wallpaper with patterned wallpaper), it would have cost me over $600, and I would have had almost one and a half rolls left over, completely wasted. So my initial DIY motivation was to save money. No doubt about that. But in turning this into a DIY project, it also gave me to opportunity to customize it specifically for my personal taste. My mom helped me by taking my wants and wishes (I wanted a less “scribbled” and harsh look to the limbs and leaves, and I wanted an overall softer design) and coming up with a totally new branch and leaves pattern just for me, while keeping the birds and butterflies from the wallpaper. And then with my new customized design in hand, I got to work. It took me many hours to finish, but cost me less than $50 for a totally customized design that’s all mine. If you want a highly customized house, the only two options are (1) to do it yourself, which will save you a ton of money but cost you a ton of time, or (2) to hire out the work. I don’t know how much it would have cost to hire a local artist to do the walls in my entryway, but I’d guess it would have cost several hundred dollars at a minimum. And as far as having custom chairs made? Well, I do know a bit more about that. Just having the frame made to my specifications (e.g., I want the back arched like this, and I want the wings to look like this, and I want the arms rounded like this) would be a minimum of $300 to $500. And then having it upholstered to my specifications (e.g., this floral fabric on back, this textured fabric on front, this fabric used for the trim, add a skirt, add this trim to the bottom of the skirt) would have been a minimum of $400 per chair. And that doesn’t include the cost of the fabric. I look forward to your posts everyday and enjoy them. Thank you for sharing your home and your talent with us. Your are right, your home is all you and it is beautiful!! I agree Kristi, DIYing is often about doing it for less money, but I love the “I get exactly what I want” aspect. That’s such a great shot of your entryway, I love staring at it and every little detail. What do you think about smallish round cushions for the chairs? A thick black and white stripe sunburst pattern..? I wish I liked round pillows. :-/ I just don’t, for some reason. I am anxious to see the chairs at the head of the table. Are they heavy? Will you add casters to the legs? Will the arms of the chairs fit under the table? They are kinda heavy. First I’ll try those nail-on sliders (the plastic things that are supposed to glide easily on carpet) and see if those work. If not, I might look into adding casters. Great read today. Thanks for sharing your thoughts – it truly resonated with me. Wow! That’s a lot for dining chairs! But for completely custom chairs, it’s totally reasonable. Totally agree with you on making it fit your style. Too many people follow trends, ending in everyone having the same look. Don’t understand why they want to be/do what the masses do. I realize many haven’t a clue how to DIY, don’t know how to start to develop their own style, but I say jump in and at least try! There are so many resources out now that weren’t available when I was starting out with my first place. I learned from asking questions, reading books and watching others who knew more than I did. Now there are blogs (like yours! ), you tube and so much more. And if you DIY and it doesn’t work, it’s way cheaper of a goof than if you pay someone and end up hating it! You have your own vision, and I have mine. Mine does not include gray walls and Pinterest designs! I’m going green walls for one thing, something that no one seems to be doing! That custom foyer just makes me smile…I love it! This!!! So right . . . and beautifully explained! You go, Kristi! Kristi, you have started/guided/inspired me down so many DIY paths. Thank you for your wonderfully detailed chapters. One question about your beautiful chairs: is there a reason you didn’t paint, stain or varnish the legs? I realize they’ll be covered up, but they look unfinished to me…its like not doing something with the inside of a cabinet or drawers just because the space isn’t on display. What am I not seeing? I have been reupholstering furniture for years now. You wouldnt believe how many people are willing to give away any old furniture. I currently have abt 12 wingbackchairs now and I am redoing all of them. Plus I dnt go to any fabric store either. I go to TJ Maxx or any store like that and buy thick curtains. So in the end it cost me around $40-$50 to make a chair. Im sure making the chair yourself is rewarding, but I also like to keep the old furniture out of the land fills. They dnt make it like they used to. I was thinking this too, for people who aren’t as brave/adventurous/handy as Kristi. I haven’t done any of my own upholstery (yet? 😊) but I love finding old wooden dressers, buffets, cabinets, etc on Craigslist or in the trash and then making them what I want with paint, stain or alterations. Older pieces are so well built compared to most (affordable) stuff today, and I get something customized & unique to me! Not to mention the environmental benefits you mentioned. Kristi the whole reason we do it all ourselves is to save money, yes, you got that; but to get it just the way we want it, and that is generally not cookie cutter. Maybe home remodelers are secret OCD! I do love your posts and if I were twenty years younger I would do some of your things! Love what you do but too tired to keep doing it. I like hiring somethings done you know? haha! I couldn’t agree with you more. It’s about getting what you want in the color and style you want it in. 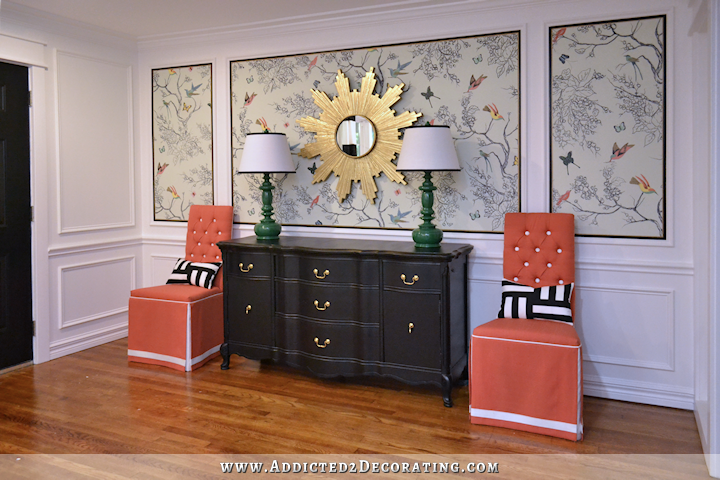 I did my entire Den (using your favorite tools) – all the furniture made by me – it’s amazing. I will never see anyone with the same furniture or the decorative pillows. I made the header over my window from your tutorial. Every time I go in that room I get such a feeling of accomplishment. That came about all because of you! Now I feel empowered to try more and more. When I see pictures of your entry – so inspiring – so incredibly beautiful – different – elegant – I can only imagine how proud you must be of it. YOU ARE SO TALENTED, GENEROUS AND SHARING. The chairs – well I am speechless! Congratulations on everything! Years ago I took an upholstery course and when I took off all of the old fabric and padding, I was shocked to see how flimsy and cheap the frame was. The chair was an Ethan Allen chair that I had chosen the fabric and had made. It is funny because the fabric I removed was very similar to what you are using now. I chose that fabric in 1975! Any way, when I saw the frame, I KNEW I could have made that chair. The lumber was very soft pine and the chair weighted nothing to move around 🙁 Like Kristi, I love to do upholstery and building the frames. The challenge is sometimes the most fun part along with having a one of a kind piece. I am finding the same thing as I strip chairs and couches. Some real shoddy stuff is being passed off as expensive furniture today. What amounts to as nothing more then a plastic feedbag is being used in place of quality jute on the backs of chairs, plastic coated stains to hide how cheap the wood is, you name it. Give me a good piece from the victorian era all the way down to the 60s anyday! I agree, new furniture is cheap and made of soft woods instead of hard woods like the old days. Even building my own frame now creates a heavier chair than you can buy in a store. I have followed you since you were in the condo shortly before you bought the house……………….and one huge thing I have learned about you, Kristi, is that you LOVE the creation process……………taking something from inside your head and placing it into you home!!! That is ultimate satisfaction and happiness!!! I love that your home, like mine isn’t like those others that we can “shop the look”. I love that most of my stuff in my home is either DIY or thrift store. I have some accessories I get from Home Goods or something but for the most part it’s unique. Thanks for being a kindred spirit :). I know what you mean about the cost perspective, but you also get the satisfaction of accomplishment. I just made a pendant lamp out of embroidery hoops and plumbers strapping and every time I look at it I get this rush that says “I did that”. Not only did the entire light cost about $32., the closest thing to it on line was well over 150 and not half the size. You go girl. None of this surprised me, because I just felt that the desire for the personal and particular design was obvious. There was no way you were going to find exactly what you are now ending up with. And if I’ve learned one thing reading your blog it’s that if you know you want a particular style or look then you should go for it, because you will not be happy with a so-so, almost made it there, substitute (that’s you as in YOU and also as in me). The satisfaction of an original “custom” creation combined with $ savings is the ultimately satisfying combination. Keep up the great inspiration! I love your blog – and, today, I realized one thing I really, really appreciate about it – as you mentioned, you DON’T have a “shop this look” link, etc. I love the inspiration to customize. Makes perfect sense to me! Lovin’ it ! On the topic of DIY, I was speaking with a new realtor over the weekend and I mentioned DIY. After a minute or two she stopped me and asked, What is DIY? I was flabbergasted. Your work is wonderful and awe inspiring. Okay, that seems crazy to me that a realtor doesn’t know what DIY means! What?! How can that be?! Girl, I love your reasoning! I love seeing you tackle these things. I’ll probably never build my own chair so it’s fun to see you do it. Totally off topic, but how did your niece’s room turn out? Would love to see a final reveal even if you didn’t do all the finish work. Ugh…it’s still not finished. :-/ She’s at her mom’s house for the summer, so now would be a perfect time to finish it up! I just bumped into your blog the other day when I was trying to figure out whether I should paint my kitchen cabinets before or after installing them (definitely after! And then put wood filler into the cracks and sand it smooth. Thanks SO much for that brilliant tip, btw). Anyway, you are right on with this blog post. My husband and I have been slogging through an insane kitchen/living area reno for the 11 months. It has involved tearing down walls, moving staircases and windows, fixing giant pieces of drywall that accidentally fell off the ceiling bringing down huge amounts of cellulose insulation with it (WHAT a mess, and it happened TWICE), tearing up old flooring, and I could go on and on and on. We also have four kids. And my husband works full time. And we homeschool. There have been plenty of moments of despair, let me tell you! Actually, when I look back, I’m totally flabbergasted with what we’ve been able to accomplish. A lot of what we’ve done and how we’ve done it has been in an effort to save money, like doing almost everything ourselves (we had some help with the stairs and with a bit of the ceiling work), and reusing the old kitchen cupboards and buying used ones that are almost the same and painting them all to match. The number of hours we’ve both put in is mind boggling. But gosh, is it ever satisfying to do things ourselves! And now that we’ve gotten past the tearing down stage and started on the finishing stage, the excitement is building and we’re working harder and faster. Maybe by the end of the summer I’ll have a kitchen! I can hardly wait!! Your blog is great, and though I started by reading about your kitchen cupboard installation adventures, I just kept on reading, and I will keep on reading. Your DIY projects are incredible and its one of the reasons I enjoy your blog so much. You inspire me to try things. If they don’t work out, I try a different approach. While I’m not accomplished with many power tools I do enjoy crafting and making crafty stuff for my home to try to make it as unique as I can. Thanks for the inspiration and I’m loving your dining room! Thanks again for a great post!! It’s definitely fun to take a creation that only exists in your mind and bring it to fruition!! I can’t wait to see the finished chairs! I never tire of seeing how you solve a problem and DIY an incredible design. My husband made furniture for a while (only for us), and those pieces cost us pennies and will last forever. Our coffee table, for instance: We bought the slab of cherry for the top for about $60, and the hardware for under $10. The rest of the table was made from scrap poplar we collected on the jobsite while our first home was being built. So much of what’s out there now for sale is made so poorly, and the materials are some sort of composite wood. But you know exactly what’s inside your chair, and it will last as long as you want to use it. That mural, in addition to being unique and beautiful, is also special because your mom helped you with it. Keep doing what your doing. You’re one slick chick. ;-> I’m envious!! I love your blog. When I was little, I remember saying that something looked very pretty, and my grandmother said to me, “you have steak taste and a hamburger budget.” I had no idea what she was talking about until I was much older, but it meant that most of the things that appealed to me were custom (and therefore, expensive). I haven’t got your skills or the ability to renovate anything, but I have painted and papered and sewn, and I love what I’ve been able to accomplish. My living room looks like me.